This is one of my favorite cars in the world – ever. When I set up my calendar of cars to feature from the various Monterey sales (yes, I have a calendar of cars to feature – I have to, this year is completely overwhelming with the number of unbelievable cars on offer), this car wasn’t among them. It didn’t show up in Gooding’s “Auction Preview.” But when their full catalog came online, I stopped everything when I saw this was in the auction. I recognized it immediately as the 1999 Best in Show winner at Pebble Beach (perhaps, if you recognize it, it is from this as well). The Double Six was first introduced by Daimler in 1926. They were over-engineered masterpieces and quickly became the car of choice for the British royal family. It is also one of only two models of cars that have used a sleeve-valve V12 (the other was a Voisin). This car has the 6.5-liter V12 making 150 horsepower. It could also do more than 80 mph. This car has the longest wheelbase of any of the Double Sixes, coming in just a few inches shorter than a Bugatti Royale, which it somewhat resembles. The body was built by Martin Walker Ltd. and The styling is just amazing – the long hood, low roof and four suicide doors all add up to a somewhat menacing – and totally breathtaking – look. 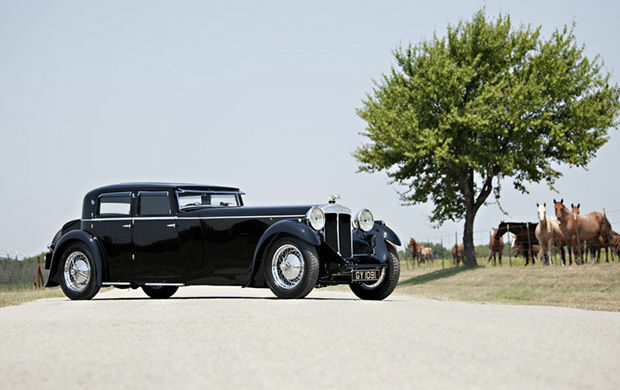 Only 26 Double Sixes were built, but this car is truly one-of-a-kind. I’ve loved it since the first time I saw it after the ’99 Concours d’Elegance. You won’t find a better-looking four-door anywhere. The pre-sale estimate is $3,000,000-$4,000,000. For the complete description, click here. And for more from Gooding & Company in Monterey, click here. This entry was posted in Uncategorized and tagged 1932, 40/50, auctions, cars, classic, classic cars, daimler, double six, gooding & co, martin walker, sport saloon by classiccarweekly. Bookmark the permalink.